We were in the popular tourist attraction in Paris and free Public Park called the Jardin du Luxembourg, when we took this high definition photo showing a modern monument called Hommage aux esclaves des colonies francaises, which translates in English to Tribute to the slaves of the French colonies. Although the monument is more like a board rather than an elaborate statue or sculpture, as you can tell from the photo, it still has a very profound meaning, and this was inaugurated by the President of the French Republic, Nicolas Sarkozy, on Tuesday, 10th May 2011. 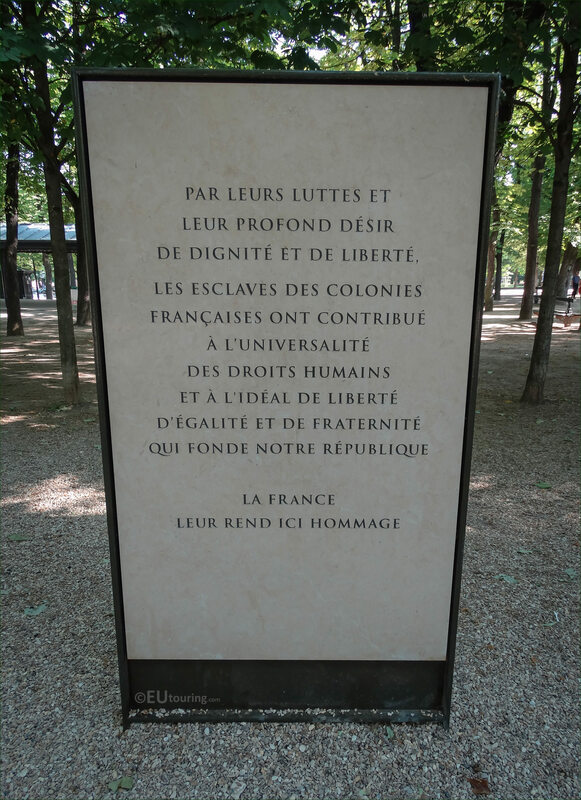 Obviously the engraved text is in French, but this generally translates in English to; By their struggles and their deep desire for dignity and freedom, the slaves of the French colonies contributed to the universality of human rights and the ideals of liberty, equality and fraternity that founded our republic. France pays them tribute. So, as we mentioned, this is located in the Luxembourg Gardens, which is in the 6th Arrondissement of Paris, and you can find the Hommage aux esclaves des colonies francaises virtually next to another modern monument called Le cri, l'ecrit, which is on the eastern side of the garden as though you are looking towards the Palais du Luxembourg.